In addition to their private rooms, guests have the use of the spacious shared living room and conservatory with comfortable lounge and dining table. Views of the surrounding gardens and forest can be enjoyed whilst relaxing in the sitting room and conservatory. Free wifi (with limited download speeds) is available in the shared areas of the house. Packed lunches and an evening "meal of the day" can be supplied by arrangement. Credit card, cash or direct debit welcome. Walker and other outdoor enthusiasts are well catered for. Drop offs and pick ups can be provided to and from the Bibbulmun Track or the Munda Biddi Bike Trail by prior arrangement. Trips 15km or less are free of charge. Similarly, meals and packed lunches can be ordered. There also extended car parking, mail holding and an ability to do laundry. 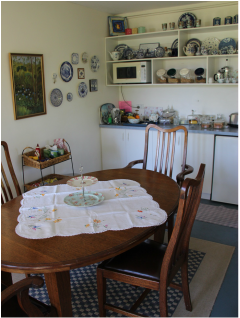 Friends of the Bibbulmun are eligible for a 10% discount on their accommodation. Whispering Pines is set on a 10 acre property with horses, chickens (and sometimes chicks), ducks, dogs, a peacock and a cat. Children are welcome to help feed the animals. Our two dogs, Poppy and Rusty, will bark on your arrival - but rest assured it is a bark of welcome, not of warning! ​Pets can be accommodated by prior arrangement, provided your pet is "pet friendly", at a cost of $10 per pet per night. Our two dogs and cat tolerate visiting dogs if they are friendly. We do not accept dogs that are aggressive towards other pets. We recommend guests use the Forest Room, which has direct outside access. Pets are not permitted in the Treetop room. Families with children and babies are very welcome. Please be aware, however, that this is a rural property with river frontage and extensive gardens. There are ponds, logs, rocks and opportunities for kids to fall off things and get dirty. We've yet to meet a child who doesn't love it here, but a certain level of adult supervision is necessary.